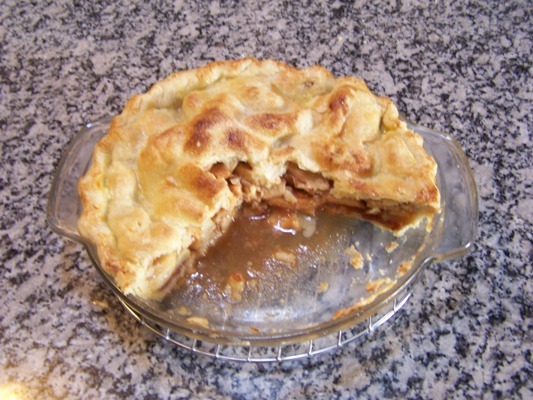 Last year we made a pie from Anna apple, and it was surprisingly decent, and so this late spring we made one from Dorsett Golden apple, which starts to ripen a week after school lets out. We gave it a definate thumbs-up, as it held together well and kept a bit of spicy tang, better than anything you’ll be getting at Coco’s right now. We’ve still had a cool spring, but if it heats up in the next couple of weeks we might chop up Dorsett Golden and mix it in with home-made ice cream, which we mix a little cider into. Apple ice cream might not be on the Baskin-Robbins list, but the flavor is perfect for a early summer evening. My wife came in with this apple that had fallen off the tree yesterday. Juicy, sweet, maybe a little on the mushy side as I don’t know how long it was on the ground, but definately the first ripe apple of our season. We’ve had a long cool spring, very unusual for our location as it often hits over 100F by April. Here it is the middle of June and we still haven’t broke 100, as evidenced by the fireblight strikes I’m still pruning out. I’ve also noticed that if Anna doesn’t get this heat, it tends to have a bit of an astringent finish which turned me off to it the first year we had it (also an unusually cool year). But not to worry, I’m sure by next year we’ll be back to our usually stinking hot springs and smooth finishing Annas. This little show-off is Anna, and is about 4′ tall. It’s done this every year since I planted it six years ago, no matter the weather or previous year’s crop load. I’ll need to prop branches up with sticks of they’ll tear off. I don’t have to do anything to this tree; no spraying, no fertilizing, not even much pruning. Thinning the heavy clusters of apples is about the only input I do all year, besides picking apples to make a June apple pie from. 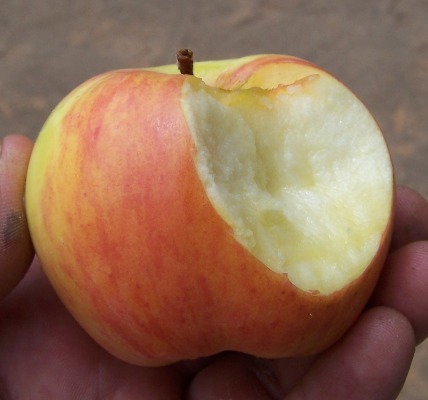 It will bear like this in the tropics of Africa or the jungles of Malaysia just like it does here in Southern California, bringing apple industry to areas where bananas and mangos were the main crops. It is a gift of God to the warm areas of the world. Richard Fahey grows it in upstate New York, where they take branches to force blossoms from for the dining table, but alas the blossoms freeze every year (it blossoms in January). But the cold doesn’t hurt the tree itself (its actually quite hardy) and the tree keeps on trying every year. We could all learn a lesson from it. We ate it warm with a slug of vanilla ice cream. 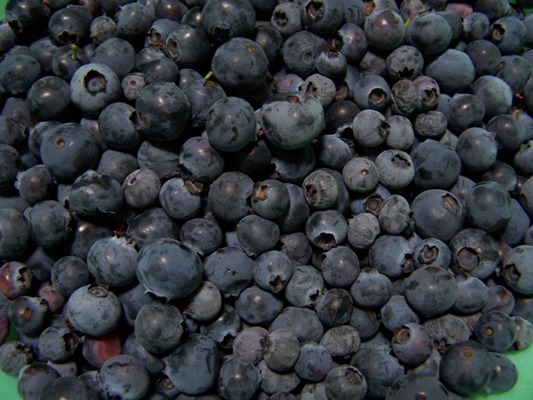 We can get blueberries from the store year ’round here, but they have no flavor or firmness. The mix we had Saturday was composed of several varieties, each giving a unique contribution of crispness, deep blue flavor, bold overtones, and wonderful juice that was like syrup. Since there was no bottom crust, we all had large portions and finished off half the thing in one sitting. We have the bushes out front and neither thieves nor birds have figured out what they are yet, and so we get to eat them all ourselves. Sure beats having some silly ornamental bush with poisonous berries that nobody can enjoy. 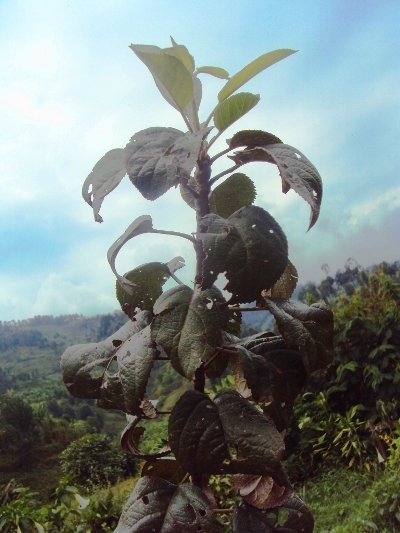 We received update photos from the apple trees that were planted in Banda, Rwanda last February. 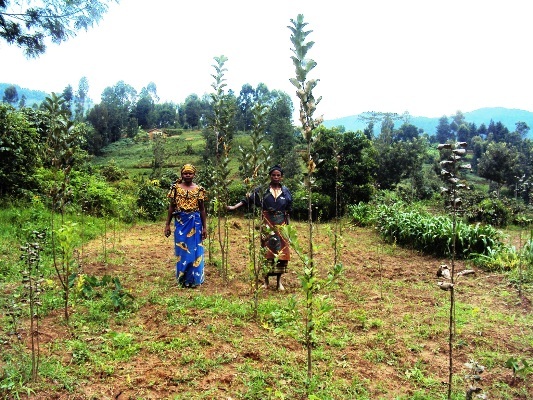 These were the first trees we shipped to Africa and we hadn’t heard a lot on their progress; I’m happy to say that they’re doing very well in this beautiful place. The trees are showing a typical growth pattern for apples planted in the tropics, tall and skinny; the one next to the ladies is probably 10 feet tall. 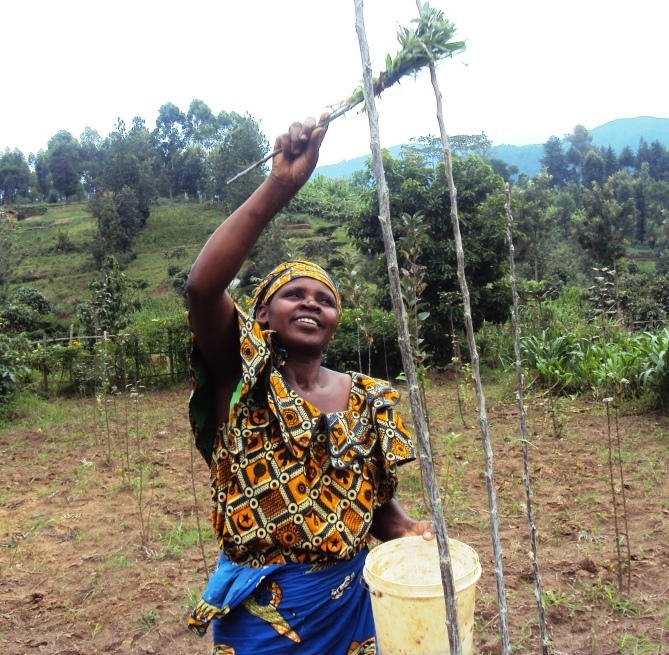 I recommended that they tie the tip if the tree back around to the trunk to make a “shepherd’s crook” that may stimulate branching. If these leaves look a bit old and ragged, its because they’ve been on the tree for over 12 months. When the leaves start to look old that’s a sign that they should be stripped off by hand, preferably at the start of a dry season. 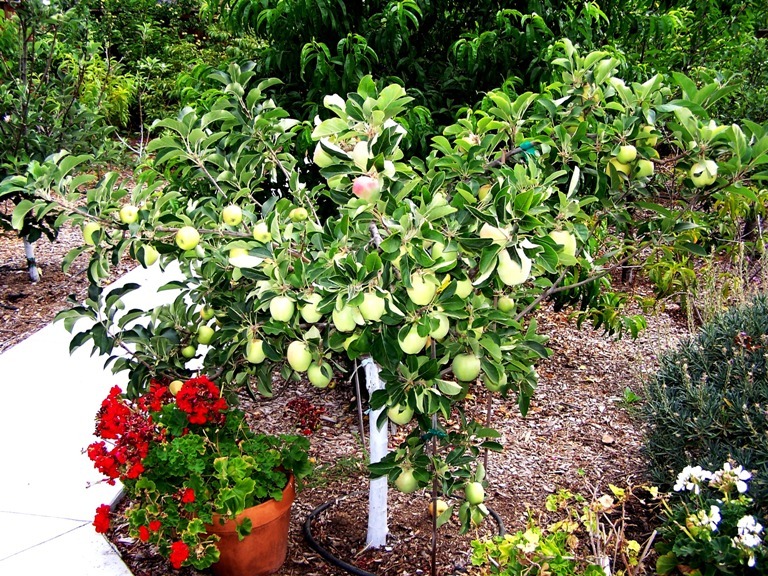 This will stimulate blossoming and fruiting of the tree. This tree is not waiting for this, as you see new leaves coming out at the tip of the tree. When stripping off the leaves this is a good opportunity to whitewash the tree trunks to protect the tender bark from the hot African sun. 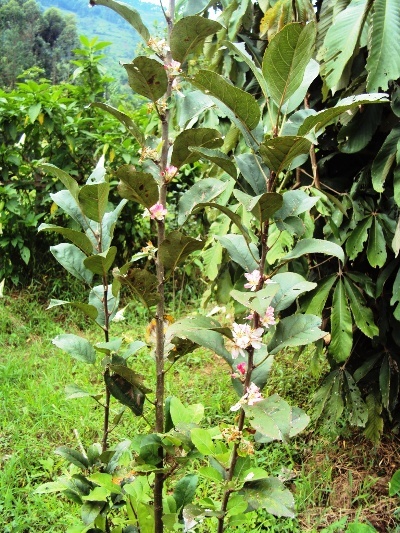 This tree is showing good adaption to the tropics by blossoming even though the old leaves still remain. 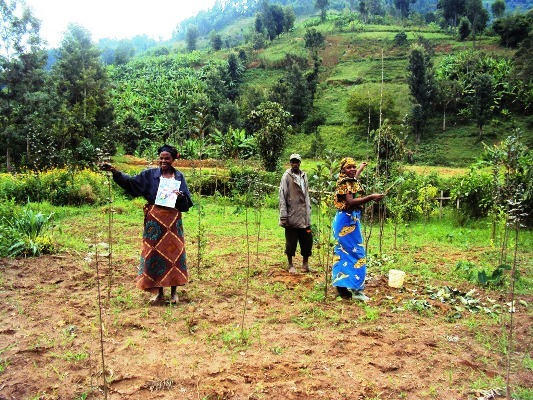 It will be fruitful in this climate with little additional work on the orchardist’ part. 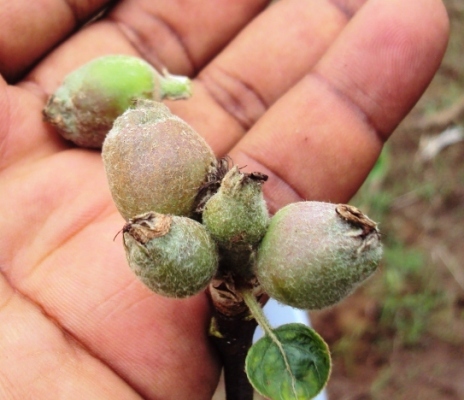 Speaking of fruit, these will be the first apples grown in Rwanda. They should be thinned to one per cluster with a hand’s spread between clusters. 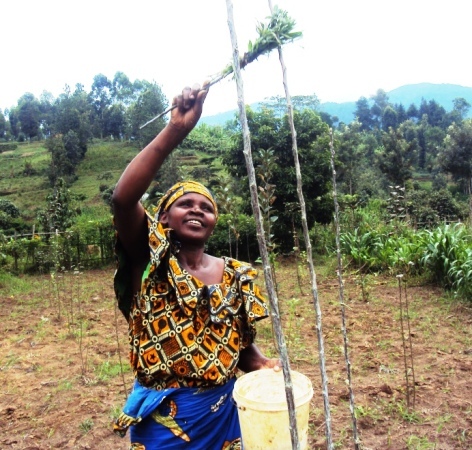 All in all the trees are doing very, very well and we’re praying that God will bless them. 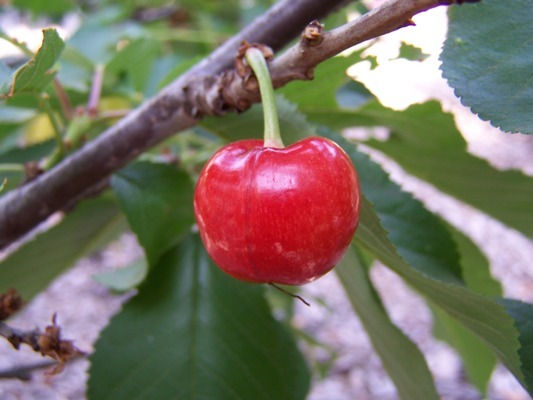 By popular demand we include this photo of one of our low-chill cherries. This variety is Lapins, which we get a few of every year (need a better pollinator for it). Our most productive this year was Royal Lee, but I ate them all before getting a photo. We got a couple dozen off the 2-year old tree, which promises to really ramp up in the next couple of years. These are sweet cherries, used for fresh eating. Pie cherries are usually more sour, but I’m tempted to bake these in a pie to see how they do; a nice turnover would also be yummy. But tonight, it will be blueberry pie!